Based on the facts of chemistry and current storage conditions, the Shroud of Turin is not now and has never been in imminent danger of catastrophic autocatalytic decomposition. The "restoration" of 2002 was based on an erroneous understanding of chemistry. Autocatalytic chemical reactions are those in which the rate increases as the amounts of reactants decrease, i.e., while the materials are reacting. The most important single factor in predicting effects is the temperature. When the temperature changes, the rate changes. The only severe heating episode the Shroud has suffered was during the fire of 1532. Any autocatalytic decomposition that occurred then has long since stopped as the Shroud is stored at normal temperatures. where ? is the fraction reacted at any specific time, t. The derivative, d? ?dt, is the rate of the reaction. E is the "Arrhenius activation energy," and Z is the "Arrhenius pre-exponential." Each applies only to a single specific, consistent reaction being studied. The value of the "rate constant," k is different at each specific temperature: It is a constant only at one temperature, and it applies only to one specific reaction. The values of E and Z are determined from a large number of k measurements at different temperatures.. Predictions of the Shroud’s expected lifetime can not be made on the basis of a single rate constant. Observations made during a scorching event can not be applied to rates at normal temperatures. E, Z, and k are the most important values in a discussion of rates and associated lifetimes of materials. All of these values have fundamental meaning in the chemical reaction. R is the "gas constant (1.9872)," a universal constant that applies to many disparate physical and chemical processes, and it is known with great accuracy and precision. T is the absolute temperature, expressed in degrees Kelvin (0K = -273.2?C). The exponents p and q allow the prediction of the position of the maximum rate in an autocatalytic process, i.e., the amount reacted at the maximum rate – at constant temperature. Exponents higher than 2 are extremely rare. 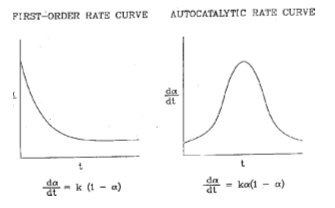 Examples of simple and autocatalytic rate curves are shown in the figure. Notice that the rate increases with time in the autocatalytic curve, at constant temperature, until it reaches a maximum reaction rate. Then the rate decreases. However, the initial rate at any temperature is much lower than the maximum rate. The chemical decomposition rate of cellulose is essentially zero at room temperature. Most long-term degradation of cellulose that is observed in archaeological contexts is caused by microbiological attack. When cellulose is decomposing autocatalytically at high temperature, the rate can be returned to its initial value by cooling. Reaction rates in solids, especially crystalline solids like cellulose, are much lower than the values for the same material in a solution or melt, because a crystalline lattice is stabilized by its ordered structure. The crystal structure is called "fibrillar" in materials like linen. A major cause for autocatalysis in cellulose decomposition is the destruction of crystalline order when the material is heated above its melting point, about 260ºC. With the exception of the fire of 1532, the Shroud has never faced this danger. Secondary, chemical autocatalysis is discussed below. Rates in the normal cellulose solid phase are essentially zero in the absence of acids, bases, short-wavelength light, or water and microorganisms. When the crystalline order of cellulose is destroyed by heating, the cellulose melt is also chemically autocatalytic. The possibility for chemical autocatalysis in linen depends on the products of cellulose decomposition. Feigl and Anger [Feigl, F. and Anger, V., 1966, Spot Tests in Organic Analysis, Elsevier Pub. Co., New York.] describe the effects of heating cellulose as follows: "When cellulose is heated it decomposes and the resulting superheated steam reacts with unchanged cellulose to produce hexoses, which in turn hydrolyze to give hydroxymethylfurfural." The only important chemical catalyst for the autocatalytic degradation of cellulose at high temperatures is superheated steam. Superheated steam does not exist at room temperature. There is no "memory effect." The Shroud should be as stable at room temperature as any other sample of linen. The Shroud was in no danger of autocatalytic decomposition. The decomposition rate of a crystalline solid depends on crystal perfection. When crystals are put under stress, they develop high-free-energy defects, and decomposition is much faster at the defects than it is in the parent material. If autocatalysis were a real problem for the Shroud, significant differences should have been observed around the stressed and strained stitching of the patches. STURP observed those areas, and there was no sign of accelerated autocatalysis, indeed there is no sign of any autocatalysis. Autocatalysis is not a real hazard for the Shroud. More detailed studies have shown that the major or secondary products of the thermal decomposition of cellulose are formaldehyde, furfural (2-furaldehyde), hydroxymethylfurfural (5-hydroxymethyl-2-furaldehyde), levulinic acid (4-oxopentanoic acid), and 3-pentenoic-?-anhydride. None of these are a significant catalyst for the autocatalytic decomposition of linen. Indeed, formaldehyde, furfural, and hydroxymethylfurfural are reducing agents, antioxidants. Furfural inhibits the growth of molds and yeasts. Scorched areas are less likely to show microbiological attack. Observations and descriptions of the Shroud through the 470 years since the fire of 1532 do not support fear of catastrophic decomposition of the cloth. There is absolutely no evidence for attack on the cloth by acids, bases, or microorganisms. Samples from all parts of the Shroud were tested for pH by STURP. No impurities that could start autocatalytic decomposition were found, confirming what was observed through the 470 years of history. If Shroud deterioration is still a worry, one practical way to slow the rate is to keep it cold. That also has the advantage of reducing microbiological attack. As in the case of the use of "inert" atmospheres, storage at reduced temperature should carefully be considered. Too low a temperature could cause physical stress and might cause fibers to fracture. It would probably cause the thin coating of image color on the fibers to be loosened in some areas. As a rule of thumb according to the Arrhenius expression, rates of normal reactions are increased by a factor between two and three for each 10?C increase in temperature. Some moderate cooling could have a significant effect on prolonging the life of the Shroud. Severe freezing could damage the cloth and image.